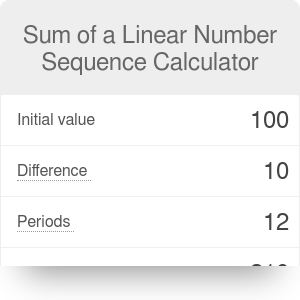 Sum of linear number sequence calculator adds up numbers in a linear sequence. This calculator deals with a linear number sequence - a set of values where every consecutive one differs by the same amount from the previous one. An example would be 20, 23, 26, 29 - it's a sequence of 4 numbers, with 20 as the initial value, 3 as the difference between successive figures, 29 as the final value and 98 as the sum of all numbers. We're selling photo storage in the cloud. Customers pay us an amount of money that's directly proportional to the amount of data that they upload - $1 per 1 Gigabyte. Alice initially uploads 5GB of family photos and then adds 2GB per month. We want to know how much she stores after a year and how much her business is worth to us during that time. Below you'll find a table with all the values and a pre-filled calculator widget. Sum of Linear Number Sequence can be embedded on your website to enrich the content you wrote and make it easier for your visitors to understand your message.